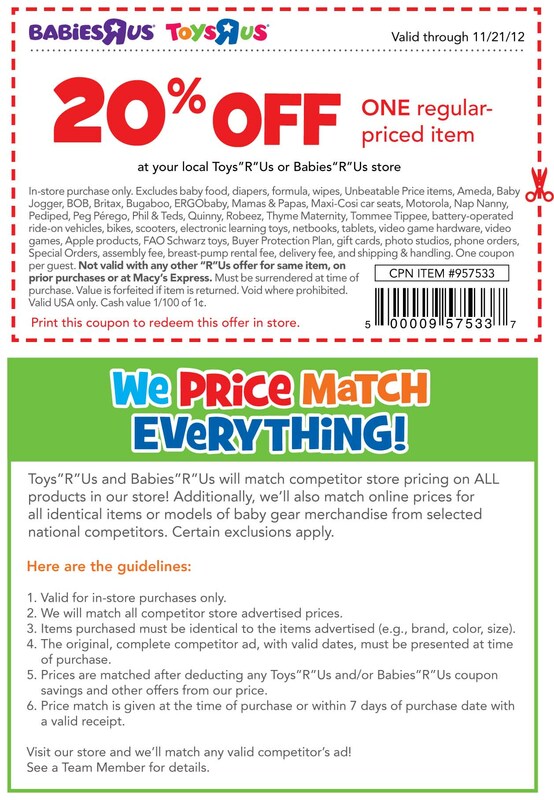 Save 20% Percent off an item using the Toys R Us Coupon or Babies R Us Coupon in store at your local Toys or Babies R Us. This coupon is valid for local stores only and is counted towards a single item from that store. There are exclusions that apply to this coupon and are listed on the coupon itself. Below the coupon you’ll find information about their ability to Price Match Everything! Here are the simple guidelines for the Toys R Us Price Match Policy. It’s valid for in-store purchases only. Toys R Us will match all competitor store advertised prices. Items purchased must be identical to the items advertised in regards to characteristics that include brand, color and size of the items. The original complete competitor ad with valid dates must be presented at time of purchase. 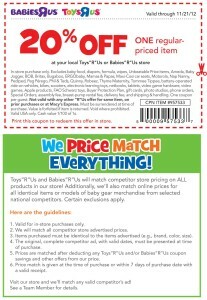 Prices matched are deducting any Toys R Us and Babies R Us coupon savings and other offers from their price. Price match is given at the time of purchase or within 7 days of purchase date with a valid receipt. So these rules not only apply to the price match guarantee, but Toys R Us and Babies R Us ability to combine the Price Match in conjunction with the 20% percent off Coupon!